3 June 2016, at 6:00a.m. GERMANY - Exports of fresh/frozen pork from Germany fell slightly in the first quarter of 2016, down 6 per cent to 419.3 thousand tonnes, when compared with the same period a year earlier. This decrease was despite a strong growth recorded in exports to China, which were up 82 per cent. Germany, like other EU major producers, has significantly increased the volumes of it pork shipments to China this year to date, capitalising on the seemingly insatiable need and high pig price. Because of this, it remains the largest exporter of pork to China, accounting for almost a quarter of fresh/frozen pork imports. Decreases in shipment volumes were recorded to other major export partners, particularly within the EU. Forecasts are for a modestly declining consumption rate in Germany during 2016, which will free up more supplies for export. However, as much of the EU market is stagnant, Germany will look to export much of this extra supply to the Asian market, so we may see export levels to this region continuing to grow strongly as the year progresses. 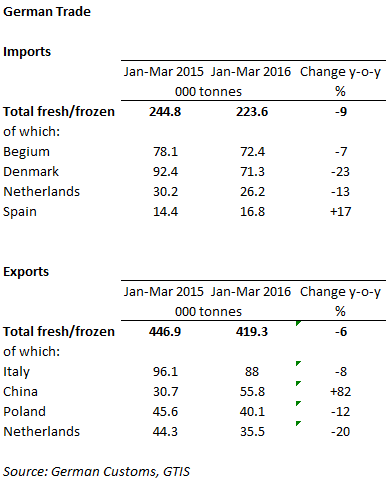 German imports of fresh/frozen pork also saw a decrease in the first quarter of 2016, when compared with the same period last year. Volumes were down 9 per cent to 223.6 thousand tonnes. Decreased shipments from Belgium, Denmark and the Netherlands were recorded, although imports from Spain, Poland, France and the UK recorded growth. However, these rises were from a relatively smaller base and may have been partly due to increased sow slaughterings in response to low pig prices.